In general, the older your home, the more likely it has lead-based paint. In homes in the city, country, or suburbs. In apartments, single-family homes, and both private and public housing. Inside and outside of the house. In soil around a home. Soil can pick up lead from exterior paint, or other sources such as past use of leaded gas in cars, and children playing in yards can ingest or inhale lead dust. Household dust. Dust can pick up lead from deteriorating lead-based paint or from soil tracked into a home. Use only cold water for drinking and cooking. Run water for 15 to 30 seconds before drinking it, especially if you have not used your water for a few hours. The job. 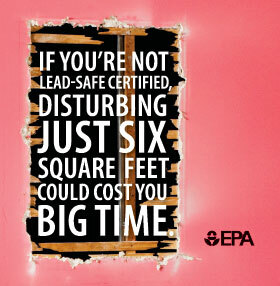 If you work with lead, you could bring it home on your hands or clothes. Shower and change clothes before coming home. Launder your work clothes separately from the rest of your family’s clothes. Old painted toys and furniture. Food and liquids stored in lead crystal or lead-glazed pottery or porcelain. Food can become contaminated because lead can leach in from these containers. Lead smelters or other industries that release lead into the air. Hobbies that use lead, such as making pottery or stained glass, or refinishing furniture. Folk remedies that contain lead, such as “greta” and “azarcon” used to treat an upset stomach. 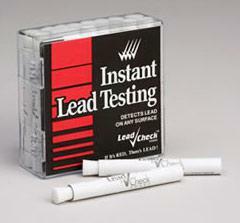 Purchase your Lead Check Swabs today via our easy payment system. Simply visit our e-store page and click on the Buy Now icon and order as many as you want.